The Rottapel laboratory uses functional genetic screens (both shRNA and CRISPR/Cas9) to identify novel vulnerabilities in ovarian cancer as a strategy to develop new therapeutic targets. They focus on understanding signal transduction pathways that operate in normal and cancer cells and the regulatory processes that control protein function. The lab is particularly interested in targeting adaptive stress pathways that support the transformed cancer state as a strategy to find new anti-cancer therapies. Other areas of research pursued in the laboratory focus on signal transduction pathways in the immune system and the study of monogenic human diseases that control inflammation, bone homeostasis and metabolism. Rheumatologist, Department of Medicine, St. Michael’s Hospital, Toronto. Dimitriou ID, Lee K, Akpan I, Lind EF, Barr VA, Ohashi PS, Samelson LE, Rottapel R.
Timed Regulation of 3BP2 Induction Is Critical for Sustaining CD8(+) T Cell Expansion and Differentiation. Gebregiworgis T, Marshall CB, Nishikawa T, Radulovich N, Sandí MJ, Fang Z, Rottapel R, Tsao MS, Ikura M.
Multiplexed Real-Time NMR GTPase Assay for Simultaneous Monitoring of Multiple Guanine Nucleotide Exchange Factor Activities from Human Cancer Cells and Organoids. J Am Chem Soc. 2018;140(13):4473-4476. Sandí MJ, Marshall CB, Balan M, Coyaud É, Zhou M, Monson DM, Ishiyama N, Chandrakumar AA, La Rose J, Couzens AL, Gingras AC, Raught B, Xu W, Ikura M, Morrison DK, Rottapel R.
MARK3 mediated phosphorylation of ARHGEF2 couples microtubules to the actin cytoskeleton to establish cell polarity. Fine N, Dimitriou ID, Rottapel R.
Go with the flow: GEF-H1 mediated shear stress mechanotransduction in neutrophils. Kent OA, Sandi MJ, Rottapel R.
Co-dependency between KRAS addiction and ARHGEF2 promotes an adaptive escape from MAPK pathway inhibition. Rabinowicz N, Mangala LS, Brown KR, Checa-Rodriguez C, Castiel A, Moskovich O, Zarfati G, Trakhtenbrot L, Levy-Barda A, Jiang D, Rodriguez-Aguayo C, Pradeep S, van Praag Y, Lopez-Berestein G, David A, Novikov I, Huertas P, Rottapel R, Sood AK, Izraeli S.
Matsumoto Y, La Rose J, Lim M, Adissu HA, Law N, Mao X, Cong F, Mera P Karsenty G, Goltzman D, Changoor A, Zhang L, Stajkowski M, Grynpas MD, Bergmann C, Rottapel R.
Ubiquitin ligase RNF146 coordinates bone dynamics and energy metabolism. Mauricio Medrano, Laudine Communal, Marcin Iwanicki, Joshua Paterson, Kevin Brown, Fabrice Sircoulomb, Paul Krzyzanowski, Josee Normand, Sasha Anita Doodnauth, Marian Novak, Fernando Suarez, Jane Cullis, Benjamin G. Neel, John McPherson, Jason Moffat, Ronny Drapkin, Laurie Ailles, Anne-Marie Mes-Mason, and Robert Rottapel. Interrogation of functional cell surface markers identifies CD151 dependency in high-grade serous ovarian cancer. Fine N, Dimitriou ID, Rullo J, Sandí MJ, Petri B, Haitsma J, Ibrahim H, La Rose J, Glogauer M, Kubes P, Cybulsky M, Rottapel R.
GEF-H1 is necessary for neutrophil shear stress-induced migration during inflammation. Meiri D, Marshall CB, Mokady D, LaRose J, Mullin M, Gingras AC, Ikura M, Rottapel R.
Mechanistic insight into GPCR-mediated activation of the microtubule-associated RhoA exchange factor GEF-H1. 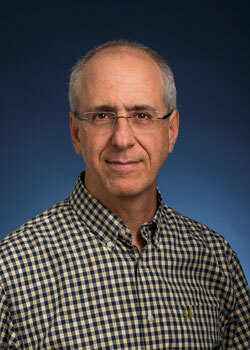 See Dr. Rottapel’s recent publications on PubMed or on Google Scholar. Amgen Chair for Cancer Research, University Health Network.